Democritus was a famous Philosopher from Greece, who lived between 460 BC and 370 BC. Democritus was born in Abdera in Thrace, an Ionian colony of Teos. His birth year was 460 BC According to Apollodorus, which probably is more to be depended on than Thrasyllos, who set ten years earlier. His father was so rich that he was said to have received Xerxes I of Persia, when he came to Abdera. Democritus spent the inheritance his father on trips to distant countries, and to have reached India, Egypt and Ethiopia. 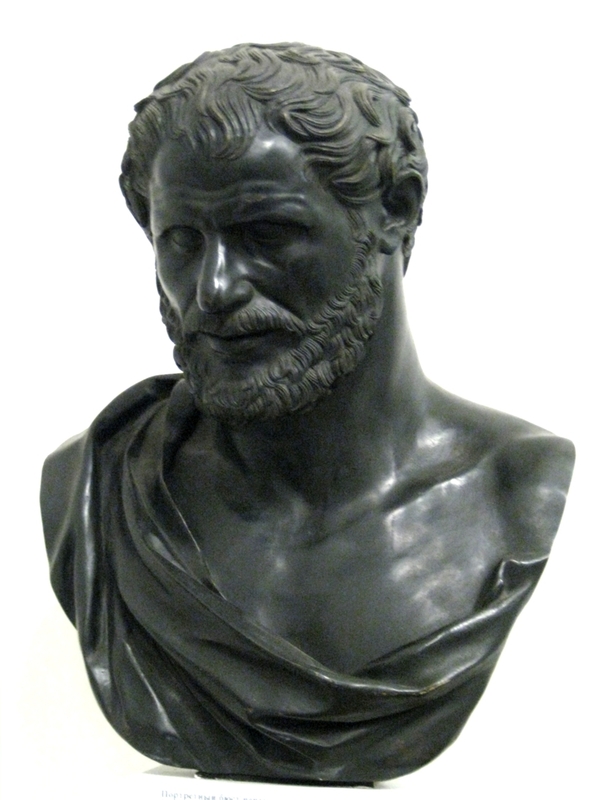 Special mentions Democritus the impressive knowledge of the Egyptian mathematicians. According to Diogenes Laertius, he was on his travels also known by "the Chaldean magic." Democritus wrote a considerable number of works on physics, cosmology, geology, medicine, ethics and politics, but all is lost - only about 300 fragments of his writings have survived, many of which are later collectors reproductions of his work. Our collection contains 19 quotes who is written / told by Democritus, under the main topics: Happiness, Inspirational, Men. "Happiness resides not in posessions and not in gold; the feeling of happiness dwells in the soul"
"It is better to destroy one's own errors than those of others"
"If thou suffer injustice, console thyself; the true unhappiness is in doing it"
"I would rather discover one true cause than gain the kingdom of Persia"
"Everything existing in the universe is the fruit of chance and necessity"
"By desiring little, a poor man makes himself rich"
"Do not trust all men, but trust men of worth; the former course is silly, the latter a mark of prudence"
"Hope of ill gain is the beginning of loss"
"Happiness resides not in possessions, and not in gold, happiness dwells in the soul"
"Good means not merely not to do wrong, but rather not to desire to do wrong"
"Throw moderation to the winds, and the greatest pleasures bring the greatest pains"
"The wrongdoer is more unfortunate than the man wronged"
"Raising children is an uncertain thing; success is reached only after a life of battle and worry"
"Our sins are more easily remembered than our good deeds"
"Now as of old the gods give men all good things, excepting only those that are baneful and injurious and useless. These, now as of old, are not gifts of the gods: men stumble into them themselves because of their own blindness and folly"
"Nothing exists except atoms and empty space; everything else is opinion"
"Men should strive to think much and know little"
"It is greed to do all the talking but not to want to listen at all"
"It is godlike ever to think on something beautiful and on something new"